Here I go again. Some things just make me angry, and I feel a burning need to put them in writing. So, read on, if you dare. As most of you know, I am a woodturner. That means I make objects from various woods by using a lathe. Check out my site using the link in the right column to see some of the items I make. This is a hobby, not a profession. I am not trying to make a living, just trying to support my hobby. I like to think I am, at least, an accomplished craftsman, if not an artist. I do try to maintain a certain level of creativity. About five or six times a year I pack up all my product, along with my tent and tables and drapes, and head for a weekend art festival into which I have been juried. All that gear fills my pickup to capacity. The set up takes about an hour and a half, with Regina helping. These shows usually run from Friday through Sunday. Friday evening is not very long, with the show running from 4 pm to 9 pm, but Saturday is a very long day, from 10 am to 9 pm. Sunday is usually shorter, with the show ending at 5 pm, but then all the product and booth has to be taken down and packed in the pickup. This is not an easy task, but I enjoy the process and the interaction with people. As you might have guessed, I’m setting the stage for my rant. My products are moderately priced. The most expensive item I have ever sold was $95, but most of my product is in the $40 to $65 range. I have little price tags on each item indicating the price plus tax. Invariably, there will be some individuals at the shows who must think they are at a garage sale or a flea market. There are questions such as, “Is that your best price?” Or, “Would you take less?” This past weekend, a lady said, “I’ll come back on Sunday to see if you are bargaining.” How rude! Luckily she didn’t come back. These village idiots obviously don’t comprehend the value of a hand crafted piece of art. Unfortunately, these questions always seem to come at a time when I have been sitting idle, with little activity for a long period of time. It takes all I can do not to lash out verbally, or even physically. What these people don’t seem to understand is that such questions and statements are demeaning and insulting. Why can’t they just behave? This entry was posted in Selling Art and tagged art, Art festival, bargaining, creativity, flea market, garage sale, village idiots, woodturning. Bookmark the permalink. 13 Responses to Art or Junk? Well said again. I saw a sign at one of our local Art Show. The sign said “This is not a garage sale”. Must be some of his garage salers go to Texas. Thanks for the comment. I guess most villages have idiots. Think back to the last time you bought a car or truck. Did you pay sticker price? I bet you didn’t. I bet you negotiated a better deal, something less than the vehicle’s sticker price. Don’t be too hard on us bargain hunters. It’s a natural thing that we do. We want to buy something at a store, but we wait for it to be on sale. Look at the insanity of Black Friday and Cyber Monday, of Washington’s birthday sales. Don’t you go online and shop for the best prices you can find for a product you want to purchase? And especially at arts and crafts or antique fairs, people sort of expect to bargain. We used to have a Victorian home in central Massachusetts, and my wife and I would go the Brimfield antique show there, which is held three times a year. 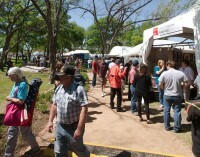 Thousands of booths selling all kinds of antiques and handmade crafts spread over many acres of fields . We rarely left Brimfield empty handed, but we never paid “sticker price.” I always looked at the price on an antique or a craft item as “the asking price,” or what the seller would like to get. But not what he or she would be willing to take for it. And in defense of that old lady who said she’d “come back on Sunday to see if you are bargaining,” that was a pretty common practice at Brimfield. If dealers hadn’t sold items by around midday on Sunday, they were generally a little more willing to negotiate the price than they were on the first few days of the fair. Why? Because whatever they didn’t sell, they would have to pack it all up, load it all into the truck, and haul it all away, where the items would likely sit until the next fair they went to. We bargain hunters are not trying to be demeaning or insulting to you craftsman, artisans, and antique dealers. You want to get your best price for your work and we want to pay the best price for the article. It’s the natural yin and yang of the selling and buying experience. I agree that there are certain selling venues where price negotiation is both common and expected. Automobile dealers, antique dealers, flea marketers, garage salers all bump their price up, so they have room to negotiate. Stores have sales, but the customer doesn’t go into the store and try to negotiate a sale price – the store decides what goes on sale, when it goes on sale, and what the sale price is going to be. When I post an item on Craigs List, I always leave myself room for negotiation. However, if you come to my booth at an art fair and see an object that you might like to own, you need to understand that I have designed this object, I have bought the materials necessary to make the object, I have purchased the equipment necessary to make the object, and I have learned the skills necessary to make the object. The price that I have put on the object is what it is worth to me. If you don’t want to pay that price for it, then don’t buy it, but don’t ask me to devalue my work. So out of curiosity, does everyone who sells items at an art fair have the same philosophy as you do, or are some willing to negotiate down from their marked asking price? I don’t want to show up at the next art fair I attend and get every booth operator pissed off at me! . I really can’t speak for everyone, but the artists I know and talk to at the fairs where I sell do have the same philosophy. But don’t worry, we are not really a violent bunch of folks. Better still, if you like something you see, pay the price. If you don’t like the price, just move on. Sooner or later you might find something that will fit your desire as well as your pocketbook. I am not trying to make a living, just trying to support my hobby. You have already set bargain basement prices, and I have bought several pieces. You are only asking for the price of raw materials, not the time you spent designing and crafting, nor the money you invested in the equipment to create your art. If you were in Tubac, Arizona or similar places your work would be priced at its true, elevated value and actually sell for that amount. It is sad too many things have become devalued today, whether it is an object, or concept or belief. There are fewer venues where the dedicated craftsmen, and those who value them, are brought together. I don’t consider something mass produced or machine produced in the same category. Thank you for your comment and for your purchases. I hope you are enjoying the pieces. I always bargain with antique dealers; it seems to be the accepted practice. But at craft fairs I pay the price on the sticker without question for all the reasons you stated so well. I self-published a book last fall, and after a reading have never had a buyer offer less or want to bargain. I see writing and woodturning as the same: both involve skill, talent, hours of work, and are priced at what seems fair to the creator. With all due respect, Doobster418 makes a false comparision and argument when he equates a handmade, one-of-a-kind artwork with an item presented purely for it’s monetary aqusition, no matter what that may be. It is insensitive, demeaning and a lack of appreciation of craftsmanship, creativity and imagination to ask an artist at any level to devalue his time, labor and skill by suggesting in any way or form that he accept less for his efforts than he deems proper. If you do not agree with him, you are not compelled to purchase, or to insult. Try to see the good unexpectedly. If you do not, be a gentleman; smile and say thank you. An all too familiar rant. I too have to respectfully disagree with Doobster. In the retail world I am convinced that sticker prices are artificially elevated precisely so the retailer can offer a “discount” and still make a profit. That warps our sense of the value of things, so it is too easy to mistrust a price that is, in fact, an honest assessment of an item’s worth. The truth of the matter,where my work is concerned, is I am not trying to make a living at this. I am just trying to support this hobby that I enjoy so much. Thanks for the comment.